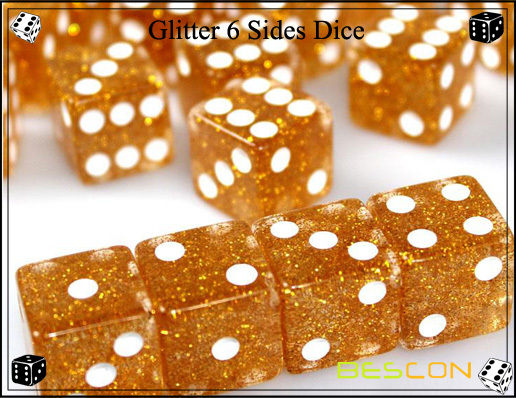 Product categories of Glitter Dice, we are specialized manufacturers from China, Glitter Blue Water Dice, Plastic Dice with Glitter Effect suppliers/factory, wholesale high-quality products of Golden Glitter Game Dice R & D and manufacturing, we have the perfect after-sales service and technical support. Look forward to your cooperation! Glitter Dice has an assortment of small, flat, reflective particles mixed in their transparent material. Glitter particles reflect light at different angles, causing the surface to sparkle or shimmer. Glitter is like confetti or sequins, but somewhat smaller. In Bescon you can choose Dice with custom color of glitter.